DETAILS: This stunning Park District home includes brand new furnishings with tranquil, neutral colors. 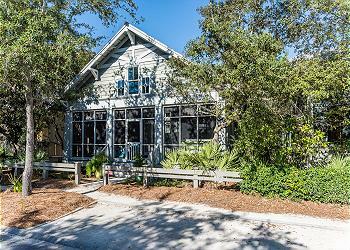 With such a central location, you are only a short walk to the beach and everything in Watercolor! Enter this home to find an open concept floor plan connecting the kitchen, living room and dining room. On a beautiful day you can escape to front porch to enjoy a cup of coffee or take an afternoon nap on one of the comfortable swing beds on the additional screened porch! Back inside, you will find the first guest bedroom. With a king bed and a private bathroom with a shower/tub combo. Just down the hall you will find the master bedroom. This bedroom features a king bed and ensuite bath with an incredible clawfoot tub and spacious shower! Have been enjoying 30-A for 15 years and this stay did not disappoint! 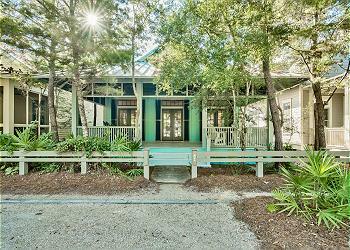 Great house, location was perfect and within walking distance to many of our favorites and the beach. Recommend for two couples or small family. 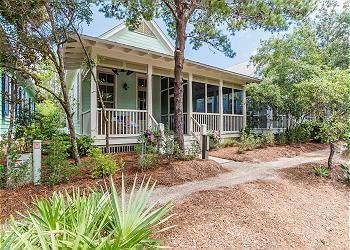 We are so delighted that you all had yet another perfect 30A getaway with us in Watercolor at this amazing home! Thank you for staying with 360 Blue, we hope to see you all again soon! Great cottage, spacious, close to everything, and well maintained with all the necessary appointments. Highly recommend. We will definitely stay here again. We are so thrilled that you enjoyed your stay with us in Watercolor! We agree that this home is situated in the perfect location making your vacation as stress-free as possible! Thank you for staying with 360 Blue, we hope to see you again soon! As first timers to seaside and first time vacationing with a newborn, we did not know what to expect, but this house made all our worries disappear. The proximity to the beach and local hotspots made travel a breeze. Everything was in walking distance, including the local wine store! The beach was absolutely perfect. White sand, clear blue waters and umbrellas and chairs for rent. The car, restrooms, and restaurant were just on the other side of the dunes. The accommodations made us feel at home right away; comfortable beds, cozy front and back porches, bikes, gorgeous decor, beautiful bathrooms and even a pack n play! Our 4 month old slept soundly through the night and so did we. Looking forward to our return, but with less anxiety and more friends. We could not be more delighted to hear how much you enjoyed your vacation with us in Watercolor! We agree that this home is perfect for a relaxing beach getaway and with all the accommodations that Watercolor and the home has to offer, it is easy to feel right at home! Thank you for staying with 360 Blue, we look forward to seeing you again soon! As first timers to Seaside and first time vacationing with a newborn, we did not know what to expect, but his house made all our worries disappear. The proximity to the beach and local hotspots made travel a breeze. Everything was in walking distance, including the local wine store! The beach was absolutely perfect. White sand, clear blue water and umbrellas, and chairs for rent. The bar, restrooms, and restaurant were just on the other side of the dunes. The accommodations made us feel at home right away: comfortable beds, cozy front and back porches, bikes, gorgeous decor, beautiful bathrooms, and even a pack n play! Our 4 month old slept soundly through the night and so did we. Looking forward to our return, but with less anxiety and more friends. We are so thrilled to hear that you first trip to Seaside was so incredibly memorable! This beautiful home really does give you the perfect location with easy access to anything you could want. We hope to see you back soon for your next beach getaway! Great home with some nice decor updates and enjoyed the convent location. It is very close to the beach and short walk to Seaside. The porches were spacious and a great place to relax spend the evenings. We did have some issues with the A/C and 360 Blue was responsive but the issue lingered through the week. We would stay in this house again as a family of 4. We are so glad you enjoyed your vacation at 82 Mystic Cobalt! We agree, this home is very conveniently located and is the perfect spot for a relaxing beach getaway. We apologize for the AC unit and that you had to deal with that during your stay. We are happy to say that has been repaired and is ready for you and your family to come back for another wonderful vacation!